The Broadcast Studio has the ability to help you create any video or audio project. We have professional studios in the lower level of 135 College Street and we can accommodate most field productions. Below is a list of typical services, but please contact us if you have an additional need. Click the headings in the list to read a description of the service. A classroom recording is the most common type of request received by the Broadcast Studio. Our expert staff understands the importance of focusing on the instructor/presenter as well as the slides and visuals used during the class session. Crisp audio and high definition video sets this service apart from automated counterparts. The Broadcast Studio will work with you to arrange a setup time and understand the details of your class session. We will deliver a digital file using YaleBox and we can upload the video to YouTube or Media Library for use on your website or in your Canvas site. We can supply a hard copy on a stick drive or DVD, if requested. Similar to classroom recordings, a lecture series involving multiple presenters, or spanning a significant amount of time, has additional requirements and planning details. The Broadcast Studio will often edit the recordings to feature individual speakers, panels, or sessions. This allows an audience to view the videos by topic or guest speaker, instead of searching through a multi-hour recording. The Broadcast Studio will work with you to understand any special considerations regarding the venue, presentation styles, and set-up of the lecture series or forum. Yale hosts hundreds of events and conferences each year. The Broadcast Studio, in partnership with the Events and Conferences Department, has an excellent track record of recording a variety of different events. From small forums, to complex conferences, the Broadcast Studio will work with you and additional vendors as needed to determine the needs of each project. The staff can deliver a short highlights video or a series of full-length event videos. No event is to small or to large for our team. The Broadcast Studio plays an integral part in all special campus events, from Commencement to the Presidential inauguration to the annual Freshman Assembly. 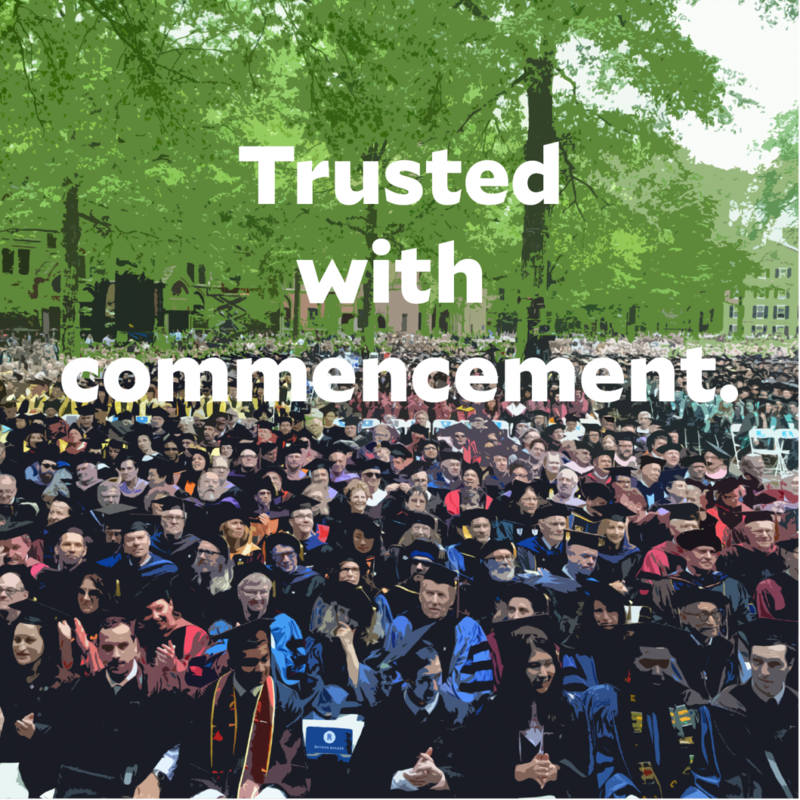 Commencement is a huge undertaking each year for the entire campus. Hundreds of staff members volunteer their time to ensure the day goes smoothly for all of the graduates and their families. The Broadcast Studio has the distinct honor of sharing the event with thousands of people around the world who cannot travel to New Haven to witness the weekend’s events in person. From proud grandparents in remote villages, to parents serving on military bases, the Broadcast Studio shares special events via a live stream. Freshman Assembly, the annual opening ceremony for Yale College, is the official moment when the freshman class becomes a part of the Yale community. They are welcomed by the President of Yale University and the Dean of Yale College. The speeches help shape their next four years. Students have the opportunity to relive these moments by watching the recordings on Yale’s YouTube channel. Television news and talk shows around the world regularly invite Yale experts to share their knowledge on select topics. In partnership with the Office of Public Affairs and Communications, the Yale Broadcast Studio enables Yale experts to appear live on-air or via pre-recorded segments. The staff uses Studio B, a world-class production facility with robotic high definition cameras, two-way communication, and connections to cable and network stations around the globe, to accomplish these projects. The Broadcast Studio also works with a variety of radio platforms to record and broadcast audio for podcasts or radio shows featuring Yale experts. The talk show format developed over several decades and has been made popular by Oprah Winfrey, Ellen DeGeneres, the Today Show, 60 Minutes, and many others. At Yale, we have partnered with several departments to create talk shows. Most notably, the Whitney and Betty MacMillan Center for International and Area Studies hosts a routine talk show, The MacMillan Report, with host Marilyn Wilkes. The talk show format has a number of models; some feature expert panels, a panel and a main host, a magazine format with one topic or multiple topics, or one-on-one host and guest interviews. The Broadcast Studio is happy to discuss the elements of a talk show and work with you to schedule an initial consultation. More than 38 million Americans listen to NPR and other talk radio programs each week. Radio shows and hosts regularly invite Yale experts to share their knowledge on-air. In partnership with the Office of Public Affairs and Communications, the Yale Broadcast Studio enables Yale experts to lend their voice to radio programs. The staff uses the audio studio to accomplish these projects. Producers and radio hosts speak directly to Yale experts in the studio. The audio is shared live via ISDN and other routes or the Broadcast staff can record and send digital files for later broadcast. The audio control room has two-way communications with host stations, allowing Yale experts to conveniently share their knowledge in a comfortable setting on-campus. The Broadcast Studio routinely works with network television outlets as well. High quality audio recordings ensure that messages are received loud and clear. The Broadcast Studio uses a purposefully designed, soundproof audio studio to record individual or multiple guests for podcasts or audio recordings. The staff at the Broadcast Studio can edit the digital audio recordings or send them to an outside service/vendor/station. A concise and well produced video is one of the best ways to market an organization or program. According to marketing experts at Forbes Magazine, video content is becoming increasingly more expected from audiences on websites, social media, and at events. The process begins with a thorough understanding of what you want to convey. A production outline and design is then created to bring your message to life. This may be as simple as a series of interviews and supporting visuals, or much more complex format with lots of post-production. The finished video can be shared, embedded on your website, or sent to a targeted audience. Studio recordings take place at 135 College Street and use one of the two studio suites. They typically take the format from one of the above service options, but they can also be more straightforward recordings of a person or people in the studio or more complex projects with additional post-production editing. Our staff is responsible for producing all of the media for Yale’s online courses as well as video messages from University leadership. If you have a project that does not fit into a category listed here, please contact us to discuss it and to determine how the Broadcast Studio can meet your needs. The Broadcast Studio offers a variety of audio and video services to the Yale and New Haven community at competitive, market rates. Each project requires a consultation with a staff member to understand the full scope and cost of the project. Learn more on our pricing page. Yale Broadcast provides a top quality product for any budget with a quick response. We are happy to partner with them on our projects because we know the job will be done in a professional and suitable manner."